Gardeners often think of dogwoods (Cornus spp.) as small flowering trees, but there are also shrubby species of dogwood that are useful in the garden, often referred to as red twig dogwoods. These also have attractive flower displays, along with a host of other interesting features. The flowers of shrub dogwoods are found in clusters of tiny white blossoms, rather than the big bold blooms of the tree species. However, most dogwood shrubs are grown as much (or more) for their fall and winter appearance, rather than the spring flower display. They are known for having colorful fall foliage and brightly colored stems that light up the garden in winter. All dogwood shrubs love moist, rich soil. Although many are drought tolerant once established, they flourish in wet sites. In nature they are usually found growing at the edges of streams and other bodies of water. They are a great choice for an area of the garden with boggy soil. They are also quite shade tolerant, often found growing under large deciduous trees. Dogwood shrubs are very cold tolerant, but in hot places they tend to suffer unless they are planted in a location with afternoon shade. Dogwood shrubs make a stunning architectural display when planted as a specimen and are small enough to grow in a large pot or planter. They have a sprawling, suckering growth habit and are capable of forming extensive colonies over time. 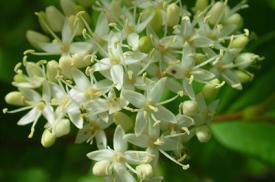 Use them as an informal hedgerow, as a border on one side of a garden pond, or in a forest area as wildlife habitat. The late summer berries are consumed by many birds. 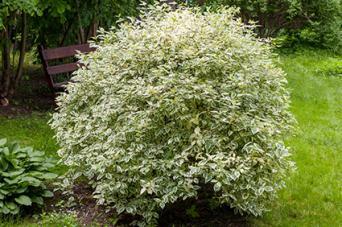 Other than providing regular moisture, little care is required for dogwood shrubs. Because they can form large thickets, they may need to be cut back periodically. Dig out root sprouts if they are coming up where they are not wanted. The bright color of dogwood stems tend to fade as the branches get older. 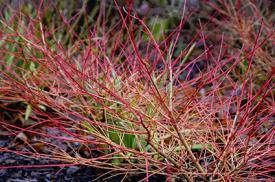 To encourage brightly-colored new growth, cut back the oldest stems in late winter. Shrubby dogwoods are prone to the same diseases as their taller cousins, but on the whole they are more robust than the tree species, which are among the sickliest of landscape plants. Fungal pathogens are the biggest problem by far, including anthracnose and septeria leaf spot. 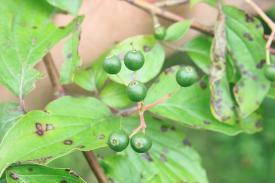 These manifest as small purple-brown spots on the foliage and flowers and can eventually spread to consume the plant. Severe cases may require fungicide treatment to keep the tree alive. Insect pests are usually not as severe as the fungal diseases, causing only minor damage. The club-gall midge causes club shaped deformities an inch or two long on small twigs. 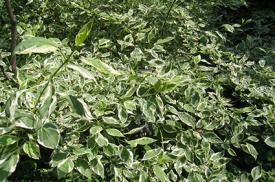 Severe infestations can stunt the shrubs a bit, though it is usually sufficient to just remove the infected parts, rather than resort to insecticides. 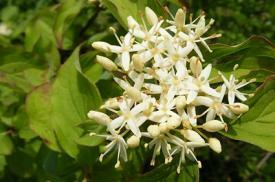 There are many species of dogwood shrubs, but the four listed below are commonly cultivated. 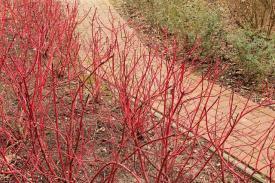 This deciduous shrub has bright red twigs in the winter and grows about six feet tall and twice as wide. Some cultivars have yellow stems, such as the variety 'Yellow Twig', available at Nature Hills Nursery. The flowers and fruit are white. It grows in sun or shade and prefers wet soil. Stem color is more vivid when the shrub is grown in full sun. It's hardy in USDA zones 2 to 9. 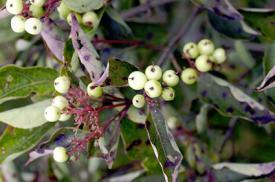 This species also has red stems in the winter. The flowers, which bloom in late spring, are white, and the fruit is black. Individual shrubs grow to a height of ten feet and a spread of ten feet. The cultivar 'Winter Flame' has red, yellow and orange stems with fantastic fall foliage and is available at Spring Meadow Nursery. It's best suited for USDA zones 4 to 8. This dogwood is native to eastern North America and is known for the grayish cast to the leaves though young leaves also have a reddish color. Both flowers and fruit are white. It grows to a height of 12 feet with the same spread and is available online at the Arbor Day Foundation. It's hardy in USDA zones 3 to 8. This type has a more upright habit than the others, growing about 10 to 12 feet tall and six to eight feet wide. The flowers are white, two-inch clusters and are followed by white fruit. The variety 'Argentea Marginata' has variegated leaves and is available at Sooner Plant Farm. It is hardy in USDA zones 3 to 8. Dogwood shrubs are not as well known among gardeners as the tree species, but they are no less worthy of attention. They are one of the few species known for colored branches and tolerating wet, shady places where many other plants are unable to survive.